FEM e.V. and it's VJ Crew reply2all organised a project called "L.i.g.h.t." - Light Impressions Get Humans Together. The aim of the project is to provide workshops and competitions in interactive videoinstallations, collaborative filming, stop-motion-animations and live VJ'ing. This year's event is the second try after the great success of L.i.g.h.t. in 2005. The basic idea of L.i.g.h.t. is to transform an old glass-factory building - the "Fischerhütte" - into a media-art lounge & point of information where young people can come together to know each other and stay informed about all aspects of the ISWI. Visual contents from other ISWI groups will be used in the video installations and at the end of the ISWI there will be a media-art-night to reflect the whole ISWI week. National and international video artists will give lectures and workshops for a video art group of ISWI participants and interested listeners. Furthermore, the student TV-station iSTUFF will broadcast the liveshow ISWISION from a studio inside the Fischerhütte. There will be different workshops during the week from 4. - 8. of june. The aim is to offer workshops and lectures about videoart to a group of ISWI participants and other interested guests and to build fancy video installations and do live VJ-Jams with them. For up-to-date information about any activities look on the iCalendar-page. will introduce the basic idea of VJ'ing with giving lectures & worhshops on different hard- &softwaresolutions for VJ'ing and interactive videoinstallations. e.g. Also taking a closer look on dynebolic & vvvv. is an internationally acclaimed VJ group. From 05.06. - 08.06 they will provide us with highly sophisticated workshops and introduce some of the newest technical equipment for Vj'ing. 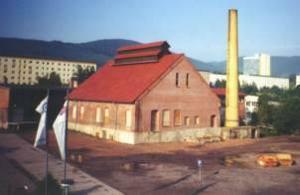 This old building was a glassworks factory until 1975. Since 1979 it is under protection of historical monuments. It will be the headquarter of the L.i.g.h.t. Project as well as the TV-studio of iSTUFF during ISWI week. It will be transformed into a multimedial lounge while ISWI week offering workshops, video art exhibitions, nonstop DJ'ing, wireless network access, a little bar and party-times. It is located in the Langewiesener Strasse 32 near the K+B market. FeM e.V. will transform the building into a modern Lounge with Gigabit internet uplink, wlan and public surf terminals, DVBT broadcasting of showcases and ISWISION TV Show. Many people and FeM teams will work on that to provide a multimedia based playground for the video-art group. The first L.i.g.h.t. Project (20. - 29.05.2005) was a great success although it was planned very spontaneously. Within the ten days the Fischerhütte more and more became the central meeting point for ISWI participants and students. And of course we had some legendary parties there. But pictures are the best storytellers, so view the L.i.g.h.t. 1.0 gallery.